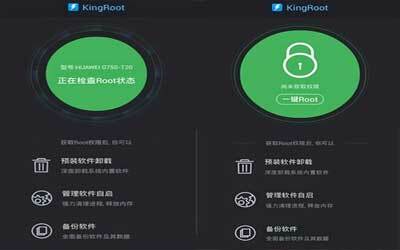 The latest version KingRoot APK 4.9.6 has been released, it is application to root Android device. Many who want to further customize their Android devices often root their devices to get wider access in personalizing their phones. In other words, rooting gives golden ticket to further access the rich features of this Linux based operating system. The advantage of rooting is rich customization and free to access everything in phone that once been limited. That is why application like KingRoot is very popular among Android users. It is a one-click easy to root Android and is developed by Kingroot studio. The latest update has fixed many bugs and logic implementation in several manufacturer, making this app an universal root tool. It can support device’s manufacturers from Samsung devices, HTC devices, Google/Nexus devices, Sony devices, LG devices, ZTE devices and Huawei devices. It can run in Gingerbread, JellyBean, KitKat, to the latest Lollipop and perhaps for Marshmallow in the later. It comes with user-friendly interface and intuitive menu that is easy to understand even for those who are new in root department. It is a powerful root tools with many options, thus, even though it looks simple on the surface, users will need to be careful not to damage the device and making device experience bootloop (bootloop usually affects troubled rooted device). There are many options available in executing root and KimgRoot has to be accompanied by several other apps. First is SU binary. SU binary is very important, it has the binary which is needed to be installed in System directory. The second app needed is King User. King User is KingRoot to manage the permissions issue on device. King User can also be used to remove system applications or disable auto start of application. The third tools needed in rooting device is King Master. King Master will improve performance by archiving notifications and automatic hibernation.